Learn about the Historic Triangle of Virginia by reading Historic Triangle of Williamsburg/Jamestown/Yorktown by Charlie Spence, IFA Member and Aviation Writer. It features a mini, but thorough tour of the destination, plus all you'll need to know to plan your trip including getting there, objective information on places to stay and eat, and things to do. At the end of the article, we've provided a summary of the contact information for your easy reference. Enjoy! 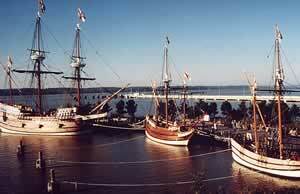 that brought the first settlers to the new world. Your airplane is a time machine when you land at the Williamsburg/Jamestown Airport in Virginia, but instead of whisking you into the future, you're transported back to Colonial days. This is the airman's entrance to the historic triangle of Williamsburg, Jamestown, and Yorktown. So much history fills this area that it is difficult to decide where to start, so take it in chronological order, going first to where it all began'Jamestown. In 1607, Captain John Smith and 103 other English persons stepped ashore and began to build the first permanent English colony in America. As you enter this area you step back in time to the 17th century. Suddenly you are experiencing the culture of Pocahontas in the Powhatan Indian village. In this re-created village, explore Powhatan life before arrival of the English, climb into a dugout canoe, and try your hand at grinding corn or weaving plant fibers into rope. Go aboard replicas of Susan Constant, Godspeed, or Discovery that the settlers sailed on the four-month journey. Enter James Fort to try on armor and watch a musket-firing demonstration. See the remains of a glass-blowing factory, the reason why the English came to America.' Glass was just developed and the English feared there was not enough sand locally to produce enough glass to fill the demands, so they sent a group to the New World to make the product. Thomas Jefferson and Patrick Henry debated. The third point of the triangle reveals the drama of the birth of a nation where the American Revolution ended with the surrender of General Cornwallis to General George Washington at Yorktown. 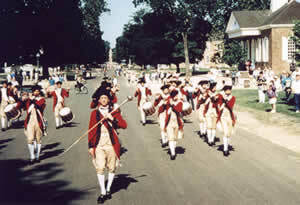 Tour the battlefield'just a short walk from the museum'and immerse yourself in the life of a Continental soldier - the encampment, the medical techniques, the camp cooking, and musket firing. In the Yorktown Victory Center, galleries, films, and personal presentations make the Revolution live again for you'and you're a part of it. If all this immersion in history gets too much for the children, or adults, just three miles away from Williamsburg is Busch Gardens, the Old Country. For nine consecutive years this park has been voted 'America's most beautiful theme park.' 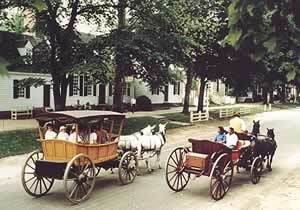 Old Country sections feature places of Europe like the French Village, Rhinefield, Germany and the Rhine River Cruise. There are dozens of rides.' If you have the nerve, go on the 'Alpengeist,' the world's tallest most twisted roller coaster. I Fly America members can obtain special discount coupons to Busch Gardens to make your visit even more enjoyable (www.iflyamerica.org/themeparks.htm). Williamsburg/Jamestown Airport (JGG) is a privately owned, public use airport. You'll find it 12 miles out on the 188-degree radial of the Harcum VOR. Try to arrive in clear weather to get a good panoramic view of the area, but if Mother Nature doesn't cooperate, there are VOR and GPS approaches. Corporate and charter flights are charged a landing fee, personal aircraft are not. Parking fees, however, are charged: Single, $8 overnight; light twins $12. If you are not staying over night, the rates are cut in half. Taxis, limos, and rental cars are available. For a wide choice of locations, prices, and for reservations, you may contact the Williamsburg Hotel and Motel Association, which represents more than 70 places, toll free at 1-800-999-4485. Also, IFA has negotiated discounted rates for their members at some of these hotels. Check rates or make reservations at www.iflyamerica.org. Meals can be anything from today's fast food to colonial dining. Four historic taverns welcome you in the historic area of Williamsburg with names like King's Arms, and Shields where the wait staffs, in 18th century dress, serves traditional menus. If you prefer a modern bill of fare, there are 11 other restaurants in or near the historic area where you can get Chesapeake Bay favorites or a choice of cuisines from around the world.